gdrive (not to be confused with Grive!) 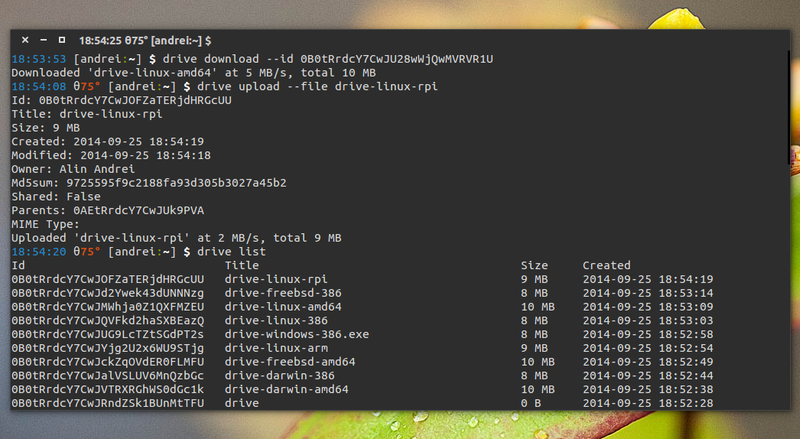 is a simple command line Google Drive client written in Go, available for Linux, Windows, FreeBSD and Mac OS X. The tool was created for uploading and downloading files from/to Google Drive and it doesn’t support any kind of synchronization. In fact, gdrive can’t even download multiple files at once. However, gdrive is still useful for one-off uploads / downloads (for automated uploads of a backup archive for example), especially since Grive, another command line Google Drive client (which does support sync) that’s quite popular among Linux users, wasn’t updated since May, 2013 and looks pretty much dead. Update: the latest gdrive now supports recursive directory uploads and resumable uploads. A link should be displayed in the terminal, which you need to copy and paste in your web browser. In your web browser, click «Accept» and copy the resulting code and paste it in the terminal where you ran «drive». Note that «drive list» lists all your recent Google Drive files, even those shared with you, etc. where «FILE_ID» is the file id which you can see when using the «drive list» command. Important: gdrive can’t upload multiple files unless you place them in a folder and pass the folder path to gdrive — for instance, you can use wildcards to upload multiple files in the current directory at once (so for example, «drive upload —file *.txt» won’t work). For more information and examples, see the gdrive GitHub page. To report bugs, help with its development, etc. see the gdrive GitHub page.